Resort is in the heart of all the action on the strip! Floating week! Buyer may receive a title fee credit, inquire for details! *Holiday Inn Club Vacations Desert Club Resort* is just a block and a half from the Las Vegas Strip! The resort offers five swimming pools, five Jacuzzis, a premier Concierge service and a complimentary shuttle service to select places on the Strip and downtown. Harrah's, the Venetian, Flamingo, Imperial Palace, Bellagio, Caesar's Palace, Paris and Bally's are all within walking distance! Suites offer Roman tubs and fireplaces, among other amenities. Please note that this resort, comprised of 3-story buildings, does not have any elevators. 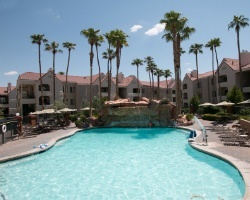 For an exciting Las Vegas escape, try Desert Club Resort! To discover more, please visit www.orangelake.com. *RCI Gold Crown Resort* Featuring a finely appointed 1 bedroom, 1 bath suite that will accommodate 4 guests comfortably. Usage is biennial even in a floating week. Maintenance fees paid annually. For more information or to make an offer, please submit the inquiry form.